C. Mark Riggenbach, M.D. is board-certified by the American Board of Internal Medicine, and is a fellowship trained gastroenterologist at White-Wilson Medical Center in Fort Walton Beach. 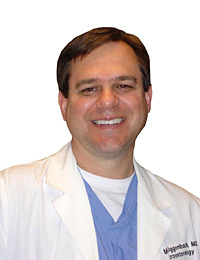 Dr. Riggenbach graduated from the University of South Florida in Tampa, where he received his medical doctor degree. After graduating, he moved to Jackson, MS, where he completed his residency and fellowship at the University of Mississippi Medical Center in Internal Medicine and Gastroenterology. Dr. Riggenbach specializes in colonoscopy procedures; upper endoscopy (EGD); flexible sigmoidoscopy; and percutaneous endoscopic gastrostomy (PEG) tubes. Dr. Riggenbach is passionate about the care he provides, and is a second-generation White-Wilson Medical Center physician.